The more the piano developed, the more composers were challenged to explore the new possibilities of this instrument. Because of this, the large number of piano works written during the nineteenth century is all too obvious. From the perspective of our century it is easy to discern the greater masters from the lesser: the music of the latter is rarely published and is also rarely, if ever, heard in concert halls. But is it always right that these composers have fallen into oblivion? Many of them were outstanding professional musicians and pedagogues and even though their music might not be as world-shaking as a Beethoven sonata can be, it is often outstanding piano music from which one may learn a lot about the technique, performance style and taste of that time. It is with good reason that Bart van Sambeek is promoting the best pieces of some of these lesser known composers. 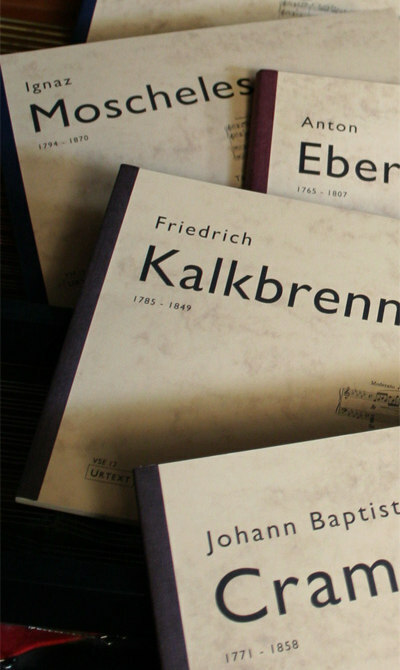 In the series Van Sambeek Edities four volumes of piano music from the period 1780-1850 have been published. A “Caprice” and a “Sonata “ by August Eberhard Müller. The language of this contemporary of Beethoven still connects us to Mozart and Haydn. Melodic and harmonic resourcefulness are not the main fortes of this music, but in the development there is much to be enjoyed. The same things apply to the three sonatas of Johann Baptist Cramer. It is striking that the Studies written by this renowned piano pedagogue (mainly known in Hans von Bülow’s edition) are much more progressive than these sonatas in both technique and in richness of ideas. This can absolutely not be said about the “Grande Fantaisie en forme de Sonate” opus 144 by Carl Czerny. Just like his teacher Beethoven, he has no fear of using daring chord combinations and technical difficulties are made subservient to the music. The two concert paraphrases on Mozart’s “Don Giovanni“ by Sigismund Thalberg are a very special delicacy. Everyone who has an interest in the titanic battle between Liszt and Thalberg now has the opportunity to explore this for himself. Thalberg is the elegant aristocrat, the sophisticated and effortless keyboard magician. His opera fantasies are a tasteful series of variations, but not more than that. Liszt’s opera paraphase is a recreation of Mozart’s dark drama and as an inventive innovator of piano technique, his Don Giovanni fantasy is much more colourfully orchestrated. Thalberg offers rest, Liszt stuns. These editions are carefully produced: outstanding clarity, beautiful quality of paper with accurate recognition of the sources and detailed commentaries. Van Sambeek Edities is a new contribution to be valued by anyone who aims for a more complete picture of piano literature from the classical and romantic eras.